Back by popular demand, we present the Wild Rapids Waterside. Experience the thrill of riding the rapids! Riders shoot down individual lanes where they encounter the thrill of a bump in the rapids before they scream around the curve to make a soft landing. 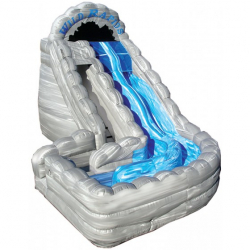 This waterslide is 18 feet tall with 2 sliding lanes that provide entertainment all day long! This waterslide allows the rider to stay on the slide while making their way to the ladder, which provides less mess in the yard after we leave, and no electrical cords to step over. A big hit at any party!